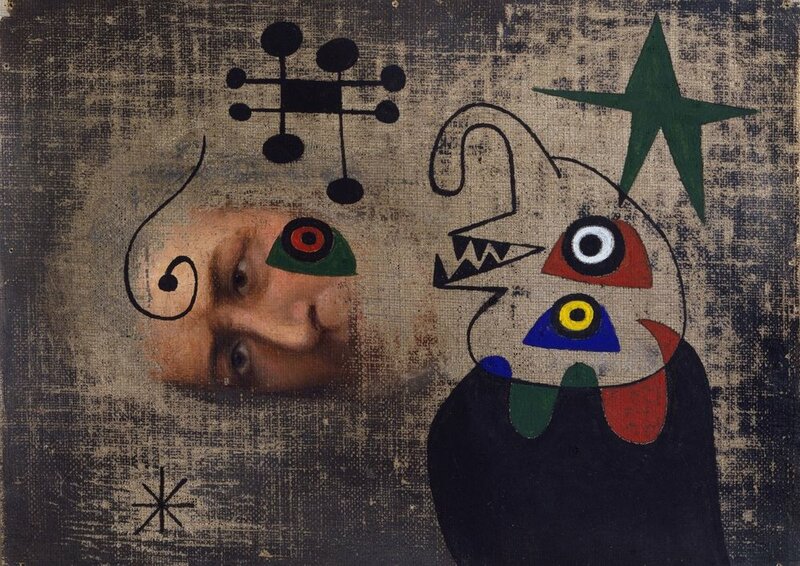 Victor Brauner, Germination, 1955. © 2018 Victor Brauner / Artists Rights Society (ARS), New York / ADAGP, Paris. Courtesy of Di Donna, New York. When the world fails to fulfill our needs and desires, we often turn to prayer—or art. The Alaskan Yup’ik people merged both strategies, crafting exquisite masks for rituals meant to influence the weather, animals, and extraterrestrial spirits. Carved from wood and often decorated with bent wooden hoops and feathers, they alternately depict hybrids of fish, fowl, and human figures. At dances and festivals, the group used these disguises to try to communicate with a world beyond theirs (they still perform these traditional rituals today). The Surrealists , who sought to liberate themselves from 20th-century European and American conventions, identified with these Western Eskimo attempts at transcendence. The Yup’ik ceased mask-making in the 1920s, after missionaries converted them into Christians. In subsequent decades, the community revitalized the tradition. While much of Christian society disregarded the Yup’ik as heathens, the Surrealists revered the objects they’d produced. Often, they used them as inspiration in their own practices.Di Donna Galleries on the Upper East Side just opened “Moon Dancers,” the first-ever commercial exhibition to pair Surrealist art side-by-side with Yup’ik productions. Against royal blue walls (meant to evoke dark Arctic waters and a sense of exploration), paintings, sculptures, and photographs by Joan Miró , Leonora Carrington, Victor Brauner, and their counterparts hang and stand near the ceremonial objects. A distinct sense of spirituality pervades the show. The galleries become contemplative spaces to reconsider the divisions between art and craft, past and present, creativity and prayer. According to scholar Marie Mauzé, Yup’ik masks became available in Europe around 1935 when art dealer Charles Raton organized an exhibition of objects from New York’s Museum of the American Indian. The photographer Man Ray bought a mask, trading one of his own works for it. In the 1940s, many of the Europe-based Surrealists moved to America to escape World War II. , Roberto Matta , Enrico Donati, Isabelle Waldberg , and the rest of their coterie. Breton proclaimed that the masks were more surreal than the Surrealists. A small party initiated by Kurt Seligmann was so intrigued that they even arranged a journey to Alaska and British Columbia, hoping to visit the sites of these objects’ production. “When used in dance, the masks act as a doorway between the two worlds,” Native American art dealer Donald Ellis tells Artsy. Many of the masks on view at Di Donna come from his inventory, while the rest are loans. Ellis explains that their usage in dance and song allowed the wearer to simultaneously speak to both the physical and spiritual worlds. Yup’ik communities frequently faced food shortages and famine; ceremonies entreated animals to sacrifice themselves for human sustenance. Many of the masks feature the face of the inua spirit, who was responsible for mediating between the realms. Four fingers often protrude from the masks’ edges, representing the characters’ hands. According to Ellis, this was superstition: Given a thumb, the spirits could grasp and steal the food the Yup’ik were trying to bring forth. All the masks in the show are made of wood. Some feature intricate combinations of pigment, feathers, sinew, and vegetal fibers. The most important mask on view at Di Donna, says Ellis, is a “weather mask” from the collection of Surrealist artist Enrico Donati, which features dangling wooden rods that resemble wind chimes. Its artistry is nearly nonpareil within Native American craft practice. Field decided to expand the scope of the show beyond just the artists who’d fled to New York. Four paintings by Victor Brauner, who stayed in France and Switzerland throughout the war, are on view. According to the curator, he “frequently worked with motifs of these very graphic animal-human hybrids using colors, feathers, [and] lots of spiritual mythology and images.” In his painting Germination (1955), a female form comprised of colorful, leaf-like fragments appears to be giving birth. Her offspring emerges, upside down, from between her legs. In the Yup’ik Complex Mask (c. 1880), mounted on a nearby plinth, an animal (perhaps a seal) appears from beneath a human-like form with a star-shaped, reddish-brown body cavity. As all these artists grappled with the onset and aftermath of Europe’s destruction, they must have felt—like the Yup’ik people—that their well-being was out of their hands. The Surrealists turned to the spirits in their own way. Kay Sage illustrated tarot cards, and one of her preliminary 1941 studies for those designs is on view. The sketch features a head split in two: One side depicts a black-and-white face with cascading hair, while the other has protruding feathers and a four-pronged claw. The idea of duality again emerges, uniting not the human and animal realms, but rather competing senses of the self. A Crane Mask (c. 1900) from Sage’s collection is also on view, and its connection to the artist’s work is striking. “This is a rare example of an artist who is actually looking at a Yup’ik mask and directly borrowing the style and imagery to make this work,” says Field. The Surrealists were hardly the first European artists to find inspiration in elements of indigenous culture. Pablo Picasso used African masks as he developed a visual language for Cubism , while Paul Gauguin depicted Tahitian people and landscapes. Today, critics might lump all these activities together as examples of cultural appropriation. Yet according to Field, the Surrealists rejected ideas of colonialism and sought a long-term engagement with these Yup’ik objects, and a significant understanding of their makers. “Our notion of how to represent the other is always evolving,” she adds.